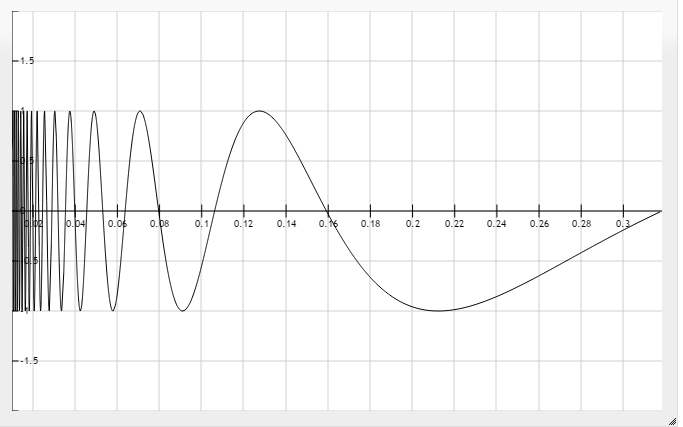 Topologist’s Sine Curve: connected but not path connected. I wrote the following notes for elementary topology class here. Note: they know about metric spaces but not about general topological spaces; we just covered “connected sets”. I’d like to make one concession to practicality (relatively speaking). When it comes to showing that a space is path connected, we need only show that, given any points there exists where is continuous and . Here is why: by maps to homeomorphically provided and so provides the required continuous function from into . Now let us discuss the topologist’s sine curve. As usual, we use the standard metric in and the subspace topology. Let . See the above figure for an illustration. is path connected as, given any two points in , then is the required continuous function . Therefore is connected as well. Note that is a limit point for though . Exercise: what other limit points does that are disjoint from ? Now let , that is, we add in the point at the origin. Fact: is connected. This follows from a result that we proved earlier but here is how a “from scratch” proof goes: if there were open sets in that separated in the subspace topology, every point of would have to lie in one of these, say because is connected. So the only point of that could lie in would be which is impossible, as every open set containing hits a point (actually, uncountably many) of . Now we show that is NOT path connected. To do this, we show that there can be no continuous function where . One should be patient with this proof. It will go in the following stages: first we show that any such function must include EVERY point of in its image and then we show that such a function cannot be extended to be continuous at . First step: for every there exists where Suppose one point was missed; let denote the least upper bound of all coordinates of points that are not in the image of . By design (why: continuity and the fact that ) So cuts the image of TS into two disjoint open sets (in the subspace topology): that part with x-coordinate less than and that part with x-coordinate greater than . So and form separating open sets for which is impossible. Note: if you don’t see the second open set in the picture, note that for all one can find and open disk that misses the part of the graph that occurs “before” the coordinate . The union of these open disks (an uncountable union) plus an open disk around forms ; remember that an arbitrary union of open sets is open. Second step: Now we know that every point of is hit by . Now we can find the sequence and note that in . But we can also find where in . So we have two sequences in the domain converging to the same number but going to different values after applying . That is impossible if is continuous. This gives us another classification result: and are not topologically equivalent as is not path connected. Hi blueollie. I agree that f(0) = (0,0), and that f(a_n) = (1/(npi),0). But I don’t think this implies that a_n should go to zero. To show that the image of f must include every point of S, you could just compose f with projection to the x-axis. Then you have a continuous function [0,1/pi] to itself that is the identity on the endpoints, so it must be onto by the intermediate value theorem. It then follows that f must be onto.